Well, mostly I love them – they do have to be cooked properly in order to achieve the love. And by that I mean they need have a lovely fluffy inside, surrounded by crispy, browned skins. None of this microwaved potatoes malarkey. Except, Panasonic told me that they can achieve exactly the potatoeyness I require, using exactly that – a microwave. Their latest microwave – a slimline combination one known as the ‘NN-CT range’ – to be precise. It’s been designed to take up 20% less space on the worktop (very necessary in our already cramped kitchen) by moving the fan into the roof, but it still has a pretty decent 27 litre capacity. And on top of that, it can achieve other miracles of cooking too. 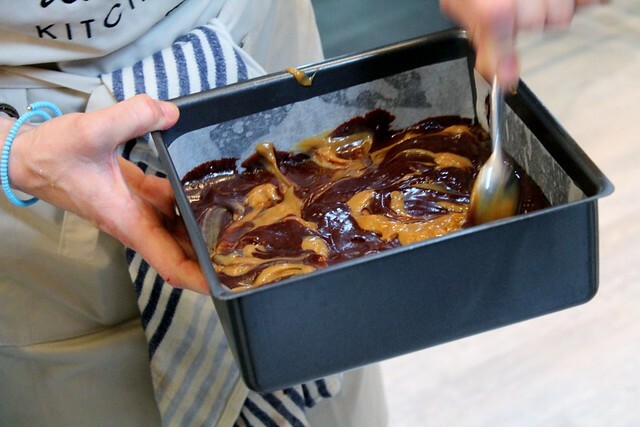 Perfectly cooked beef, decadent dulche du leche brownies… in fact, apparently it can deliver a full on delicious meal in a fraction of the time you’d expect using a conventional oven. It grills, it bakes, it microwaves…and of course like all microwaves it can defrost stuff and accommodate a microwave steriliser too, if you have time to do that between all the culinary creation going on! It all seems a bit unbelievable to me, but they’re so sure of the amazingness of it that they invited me along to see for myself what it can do…and what their other new product the SD-ZB2512 breadmaker can do too (which in no particular order includes artisan bread, sourdough, cakes, focaccia, and scones, as well as a lot of other doughy things). 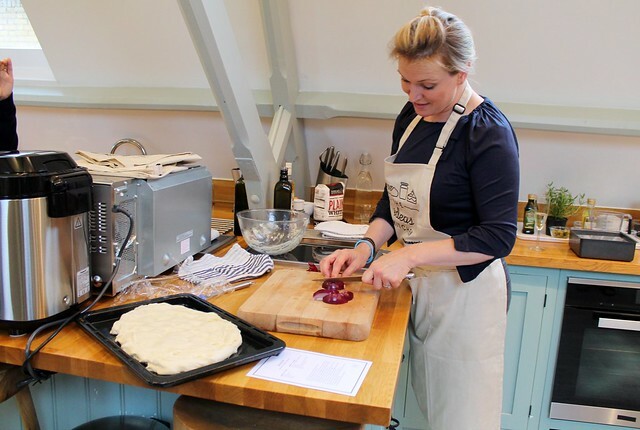 So that is how I came to be sat in Cactus Kitchens one evening recently, watching Rachel Allen (TV Chef, Author, Mother, Journalist and all-round-awesome lady) demonstrating exactly how we could command the microwave and breadmaker to bring forth a feast for us all. Which we were then expected to replicate ourselves. 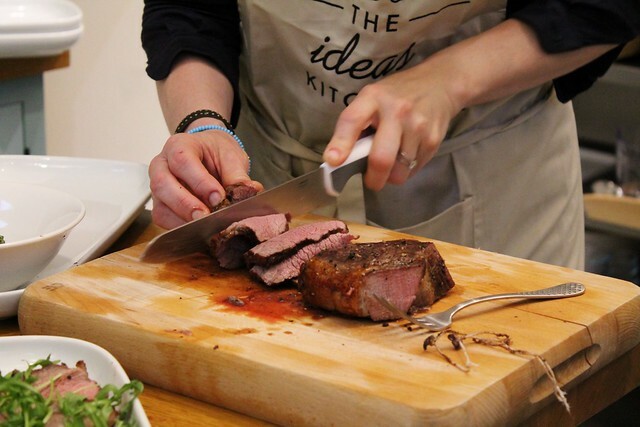 There are lots of different recipes that Rachel has created for Panasonic as part of The Ideas Kitchen, and I was allocated jacket potatoes filled with cheese and ham, and focaccia bread. 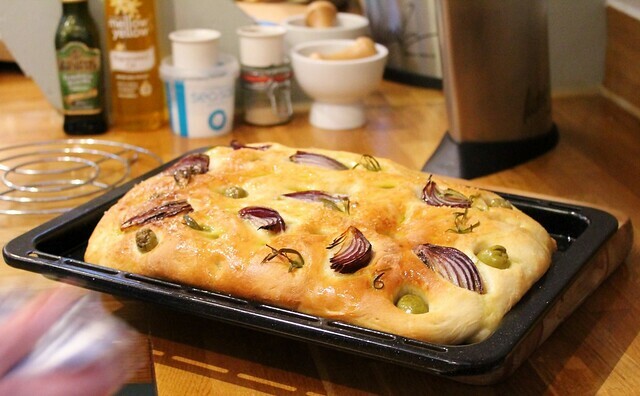 Now, the breadmaker may be quick but it’s not THAT quick – so I made the foacaccia mix, dropped it in the machine and watched it start whirring…and then promptly picked up the ‘here’s one I made earlier’ dough that was left sitting on the side for me. That seemed fair enough – I was hungry and otherwise I’d have been waiting a few hours, staring at the sleek shiny breadmaker as it gently whirred in a corner. I’m fairly confident, having seen it at work, that what eventually emerged from my own dough mix is exactly what was waiting for me in the bowl. So I took the dough out of the bowl, spread it across an olive oiled tray, and prodded at it a lot until it was looking very dimpled. 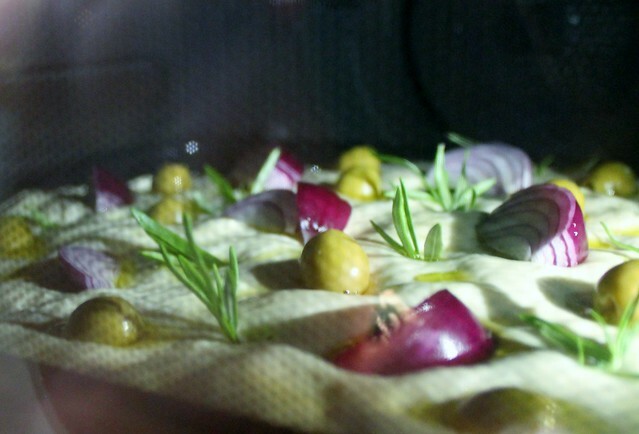 Then I added rosemary sprigs, sliced red onion, olives, a liberal splashing of more olive oil and a sprinkling of salt before sticking into the Panasonic NNCS894 (that’s another of their lovely combination microwaves) to prove for a bit. While that was going on, I washed the potatoes, stabbed them all over briefly, and bunged them in the microwave for about 15 minutes. Next I grabbed some grated cheese, some chopped ham, a dash of mustard and some cream, and stirred that all together to make a bit of a filling – ready to be served alongside a generous dash of Ballymaloe Relish. And then there was a bit of waiting – but the waiting was filled with watching everyone else preparing their dishes – roast beef with a salsa verde, lemon drizzle cake, double chocolate dulche du leche brownies, even more jacket potatoes, and some ‘little crusty things’ which apparently are called croustades. It all smelt GORGEOUS. Torturously gorgeous, as I was by that point pretty starving hungry and Rachel had been intermittenly passing by with all kinds of marvellous creations from her earlier demonstration session, completely cooked and ready for our dinner. Luckily it turns out that Panasonic are entirely accurate in their claims. 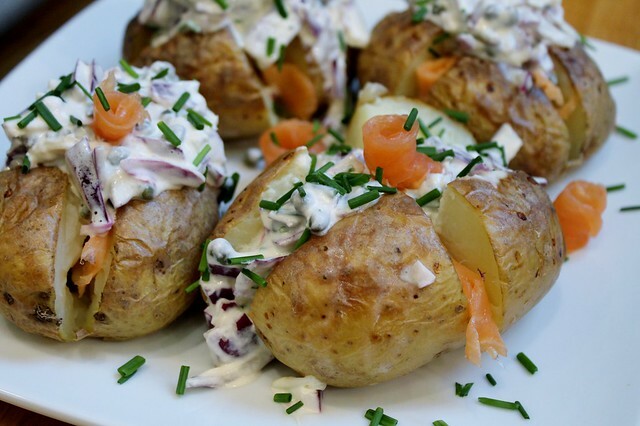 Jacket potatoes with crispy skins certainly can be created by their microwave. Gooey, perfectly textured brownies actually can be baked in minutes. And delicious, light and brilliantly baked focaccia emerges easily from the efficient breadmaker and NNCS894 microwave oven. Following the recipes created by Rachel was easy, and I’m pretty sure I’d be able to replicate them at home with very similar results, given the chance. Which I actually will be as we are looking forward to giving the breadmaker a thorough testing soon! 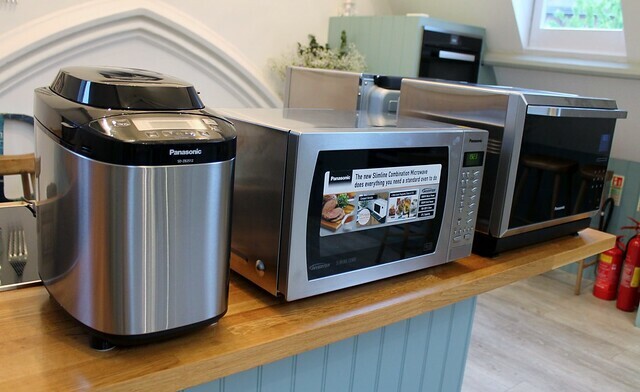 15 Responses to "Miracles of microwaving – the Panasonic NN-CT slimline combination microwave and SD-ZB2152 breadmaker review"
Sounds heavenly. I love using my breadmaker, but there are things that I am less than happy with about it and I can’t justify buying a new one (try as I might). Loving the idea of proper oven cooked baked potatoes from a microwave and the sound of cooking brownies in 10 minutes. You know my microwave is so old we could do with a new one. And can you believe I have never had a bread maker – could do with one cost me a fortune today because we run out of bread last night. Really interesting day you’ve had! I love baked potatoes too but have only ever managed to get them right by cooking in the microwave first then finishing off in the oven – guess I need a new microwave! My mouth is literally drooling at those brownies too. We are on our second breadmaker from Panasonic and I swear by them. Our first one was used 3 times a week for over 10 years! 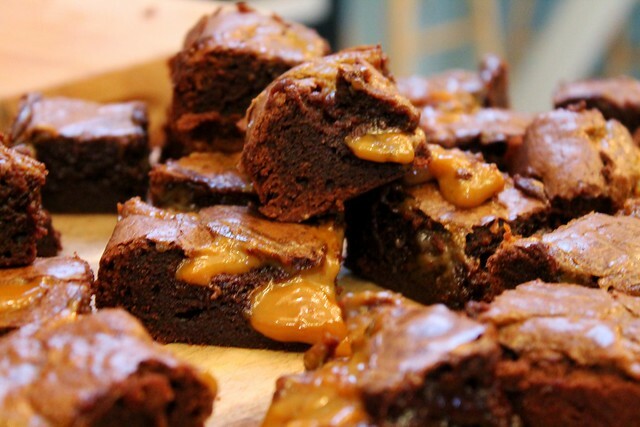 I am positively drooling at your photos – especially the brownies. Who knew a microwave could be so clever! Cass@frugalfamily recently posted…A few of my favourite frugal and thrifty bloggers…. OOOh what a great day , wish I could have been there with you . I really need a new microwave and breadmaker – both have seen better days. I have had a Panasonic microwave that does amazing jacket potatoes for a few years now and it’s bliss, I wouldn’t be without it! Wow what an interesting sounding day – I had no idea you could do so much with a microwave. I LOVE my Panasonic Combi microwave I have used it so much, last recipe was for my chocolate and mint brownies, they were delicious. Gosh all of that food looks delicious….and I need a new microwave too!! 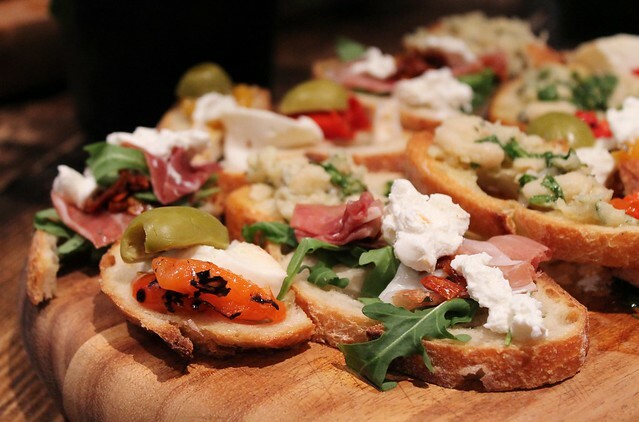 The foccacia looks delicious, and oh my, those brownies!! I tend to half cook my jackets in the microwave then shove them in the oven to crisp up (cant bear soggy skins!) but this would be easier – next time we upgrade our microwave I will be on the look out for one of these!